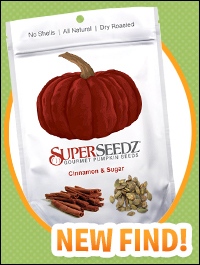 SuperSeedz Gourmet Pumpkin Seeds - These aren't the pumpkin seeds from your childhood -- the flavors are better, and the shells are gone! Choose from eight varieties: Cinnamon & Sugar (love! ), Coco Joe, Tomato Italiano, and more. Eat 1/4 cup (1 oz.) for 150 - 170 calories, 12 - 14g fat, 0 - 210mg sodium, 3 - 6g carbs, 2g fiber, 0 - 3g sugars, and 7 - 9g protein (PointsPlus® value 4 - 5*). They may be high in fat, but pumpkin seeds are super nutritious -- check out all that protein! Plus, you get a lot of seeds in each serving. Find these at Whole Foods, Vons/Safeway, Stop & Shop, ShopRite, Big Y, and other retailers, or order online. Tribe Farmer's Market Hummus Line - The Tribe members know what they're doing in terms of hummus, and we're flipping over the flavors in this line: Harvest Carrot & Ginger, Cucumber Tzatziki, and Vine Ripened Tomato & Basil. Talk about original! Each 2-tbsp. serving has 50 - 60 calories, 3 - 4g fat, 135 - 160mg sodium, 4 - 5g carbs, 1g fiber, 0g sugars, and 2g protein (PointsPlus® value 1 - 2*). Rolling out now at supermarkets nationwide. Al Dente BonaChia Pasta - Chia is a buzzworthy ingredient these days, and here's one more way to try it out. This all-natural vegan pasta packs a good dose of protein, fiber, and omega-3s, especially the Whole Wheat Fettuccine. There's also regular Fettuccine, Spinach Fettuccine, and Linguine. A serving (1 1/2 cups/2 oz. dry) has 190 - 200 calories, 1 - 1.5g fat, 0 - 30mg sodium, 38 - 40g carbs, 4 - 6g fiber, <1g sugars, and 7 - 9g protein (PointsPlus® value 5*). Look for it at Whole Foods and Fairway locations... Also available online. What's Up, Mc? - In the interest of telling people what they want to know, McDonald's has launched a new program called "Our Food. Your Questions." Send in your Qs -- like "What's in a Chicken McNugget?" -- via Twitter. And browse around to see which questions have already been answered. Cool! Coffee That Delivers - When it comes to great coffee and food, the peeps at Starbucks have been "bringin' it" for a while. But starting next year, they'll literally be bringing it... as in, delivering your order! Yup, in 2015, Starbucks will offer a delivery service to loyalty-program members in select markets. We hope the brand's also investing in stay-hot coffee cups and extra-tight lids! Taco Bell Gets Faster - Time is precious. T. Bell clearly gets that... which is why the chain has launched a mobile app that lets you order before you even hit the premises. The best part? How easy it is to customize your order. Nice! Might we suggest the Cantina Power Menu? Sonic Gets Less Sweet… In a Good Way - If you need a fizzy beverage with your fast food but are looking to cut calories, Sonic's here to help! The drive-in joint's new "Sonic Splash" drink line allows you to add no- or low-calorie flavorings to carbonated water, resulting in drinks with 0 - 50 calories per 8-oz. serving. Super impressive... We'll be pairing ours with a Grilled Chicken Sandwich (hold the mayo). Craving seasonal sweets, minus the ginormous calorie counts? 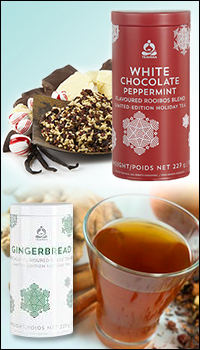 Teavana has unleashed some limited-time holiday teas: returning fave White Chocolate Peppermint and future-classic Gingerbread! Holiday flavor without a calorie commitment? We'll raise a glass to that... ***Calling all Greek-yogurt fans: You'll want to check out Easy Ways to Make Greek Yogurt at Home, from our pals 'n partners over at About.com. So cool! Not sure we'd call the from-scratch technique "easy," but we can't wait to transform ordinary yogurt via the second method... ***For anyone who's ever wrestled with rolled parchment paper or scrubbed baking sheets for ages to remove burnt cookie bits that just won't budge, the new Reynolds Cookie Baking Sheets are a must-buy. They're cut to the size of average cookie sheets, and come out of the box flat. Cue the cake pops! ***We're already huge fans of Japanese food here at HG (sushi and kabocha squash! ), but a team of chefs in Kyoto is attempting to scientifically perfect their food. From aroma-infused bubbles to an Everlasting-Gobstopper-like mouthful, these guys mean business! We would like to officially volunteer to be taste testers... And that's all we've got. HG out! Your pals need today's food news... Click "Send to a Friend!" Today, November 10th, is National Vanilla Cupcake Day. While mini 'nilla cakes are fine, we're breaking out our recipe for Strawberry Lemonade Cupcakes instead!